Waikato Stadium opened in 2002, replacing the old Rugby Park. The first event to be held at the new ground was a Super 12 match between the Chiefs and Crusaders. In 1925, Rugby Park opened with a 60 foot long stand, and in 1930 the ground hosted the touring Great Britain team for a tour match against a combined side. In 1934 the roof collapsed Rugby Park's Grandstand, with no injuries, but it was not until 1958 that a redevelopment of the ground commenced, opening in 1959. In 1981 a tour match featuring South Africa was called off after protestors stormed on to the pitch, outraged at the South African Apartheid regime. Rugby Park hosted a game at the 1987 Rugby World Cup, when Fiji took on Argentina, but did not see any further international rugby until after its redevelopment, which was commissioned in 1996. The work was completed in 2002, with ground having been broken in 2000. 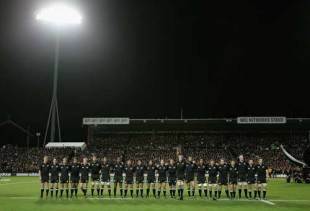 Since then the stadium has hosted the Chiefs in Super Rugby and Waikato in domestic competition, as well as hosting five All Black Test matches.